Jeffrey’s working late in the fields tonight. There’s been snow in the air the last couple of days, so winter is chasing him. He’s so close to being done with harvest so that he can put his “farmer hours” away until it’s time to plant in the spring. We’re looking forward to him being back on a normal schedule so that we can see him at breakfast and supper, not one or the other (or neither). 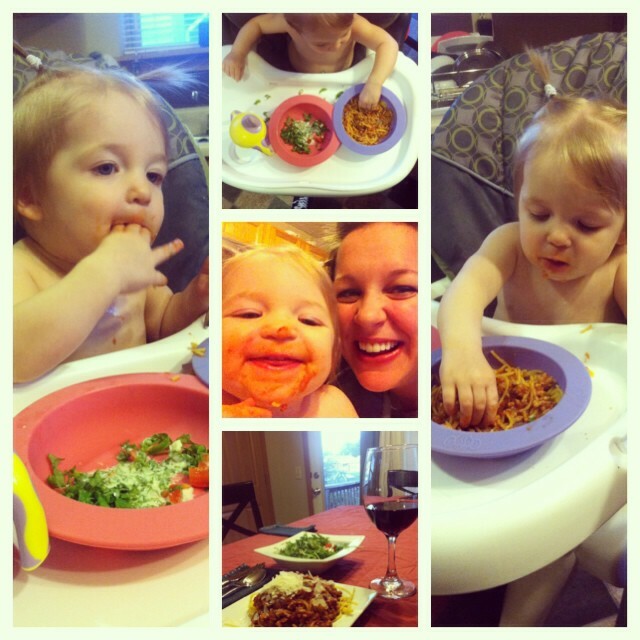 Since it’s just us girls tonight, we decided to go on a fancy Italian dinner date… in our kitchen. Bug was afraid she didn’t have anything fancy enough to wear, so she just came in her diaper. But we had a great time anyway. I took a little post-nosh video because this girl was just being too yummy. Enjoy! I’m off to throw that girl in the bathtub! Oh, she’s sooooo cute. I guess you can’t get sauce on you clothes if you’re not wearing any. : } I still dont understand where she puts it all — she’s so petite. I love the little pony tails too. And, i hope Jeff gets some rest soon. Thanks for sharing ! Paige is so cute!We loved it! Give her a hug from us !